Often it happens, when you install numerous software on your system, which results in the system to boot up slow. Most of these software are set to start up automatically when system boots, so when the system starts, it automatically tries to load all startup applications. Consequently, it affects the system boot time and result in a slow boot process on MAC. Some applications are essential, which needs to be loaded at startup like antivirus, Firewall application, etc. But some other applications that are not really very essential to be loaded while system boots. It’s better to remove such application from startup to increase system performance and booting time. 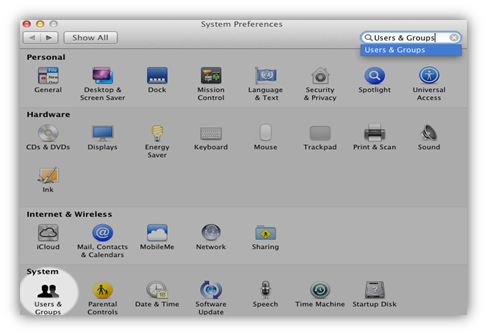 Note: Prior to MAC OS X 10.7 may see “Account” option instead of “Users or Groups”. 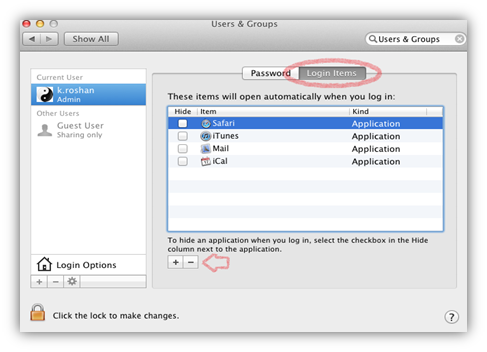 Prior to MAC OS X 10.2.8 or earlier, you can directly open Login Items from System Preference window itself. 3. Now, click on the lock icon and Enter the user administrative password..
4. Click on “Login items” tab, you may see a list of applications, which are loaded while system starts. To remove application from startup, highlight the application by selecting and click on “-” button to remove the application from the startup list. We are just removing the application from startup list and not uninstalling the application. The applications which are removed from the startup list will not be started automatically when you next time start your system. Note: As mentioned earlier, some applications are very essential and needs to be loaded when system boots like antivirus application to protect the system from the virus. So, make sure you be careful while removing application from the list.